Thomas & Betts Dragon Tooth Connectors and Crimping Tools are designed to cable splice, tap and terminate magnet wire from 32 AWG to 460,000 CMA copper and 20 AWG to 460,000 CMA aluminium conductors in motor and transformer applications - Dragon Tooth Magnet Wire Connectors penetrate the cable insulation and oxide layers to make electrical contact on magnet wiring. Thomas & Betts Dragon Tooth crimps and cable connectors create a permanent low resistance electrical connection. The tough, high temperature insulation on magnet wire used by electric motor and transformer manufacturers creates problems in cable splicing, cable jointing and cable terminating - the durability of magnet wire insulation has made dip-soldering or brazing extremely difficult without stripping the cable insulation. Another cable splicing and cable terminating challenge involves the use of aluminium for magnet applications - a manufacturer connecting or crimping aluminium magnet wire to cooper is confronted with the problem of the different co-efficients of thermal expansion of aluminium and copper, galvanic corrosion, cold flow and rapid formation of oxide film on the wire surface - Thomas & Betts Dragon Tooth Connectors include Insulation Piercing Connectors for Splices, Ring Terminals, Fork Terminals, Disconnects and Taps. 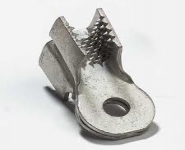 Thomas & Betts insulation piercing Dragon Tooth connectors eliminate the need for welding and cable insulation removal - installed in seconds with appropriate Dragon Tooth Crimping Tools.